If you're looking for games, entertainments, or activities for an indoor event we have a great selection available for hire. These games and activities are ideal for after conferences entertainment, in breaks between presentations, evening galas, exhibitions, and parties. Racing games are always a very popular choice for indoor events and you have the choice of Racing Simulators including both virtual reality and full motion models. Our Side Stall Games are great fun for everyone and can be supplied with or without prizes. Each stall requires an overall operating space of 8x8x8ft but you can combine two or even three games into one stall. Mini / Crazy Golf gives the golfers a chance to show how little their handicap certificates mean away from the regular greens! You can hire anything from one to six holes. A Giant Games evening gives participants the chance to play favourite family games on a much bigger scale. 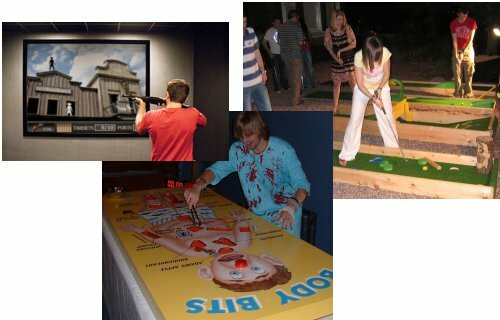 The Giant Body Bits, Giant Jenga, Giant Connect Four, Giant Wonky Wire, and others always go down well for some sociable fun and the Giant 6ft Velcro Dartboard is another item that can be included with this package. If you'd like to hold a themed evening Wild West is always the easiest theme as everyone can find themselves a pair of jeans and a checked shirt and it doesn't involve looking too daft! For the more outgoing the Rodeo Bull provides great fun and needs just 18x18x9ft while the Inflatable Cork Gun Range, which needs 18x16x9ft, Cactus Hoopla, and Tin Can Alley provide some more laid back Wild West fun.The Wild West themed games can be hired individually or we can put a complete package together including some themed decorations. Our Inflata-Frame Games can be set-up in a row of three comprising a Penalty Shoot, Mini-Cross Bow Shoot (rubber tipped! ), and Golf Chipping. For some fun foods we can offer Popcorn and Candy Floss machine hire, and our Pick n Mix stand. These are just a few ideas and we're happy to work with clients to tailor an event all attendees will remember. If you'd like to discuss your event further please don't hesitate to contact us and we'll do our very best to help.